I'll try keep it brief because this flick has been out a while, everyone knows about it and lots have probably seen it so I thought I'd take this opportunity to put it back in the minds of those who haven't seen it yet. The Other Guys is a buddy-cop comedy. Detective Allen Gamble (Will Ferrell) and Detective Terry Hoitz (Mark Wahlberg) are the buddy cops and Michael Keaton, I mean Batman, plays their Captain. 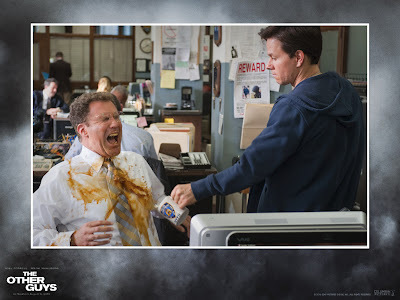 Will Ferrell is Will Ferrell, you get what you expect and he was funny as ever in this one. Probably one of his better performances actually. Mark Wahlberg and Michael Keaton were major surprises though. I expected this to be the sort of comedy where Ferrell would be awesome and Marl Wahlberg would just be making up the numbers. Who would of thought that old mate Dirk Diggler could be really funny. He was brilliant. Almost on par with Ferrell but in a totally different comedic style. He wasn't being a total weirdo like most of Will Ferrell's characters are, he was just a New York City cop pissed off with the world but his character was so tragic that it was funny. I was so impressed. Now the Scottie Pippens to Wahlberg/Ferrell's Michael Jordans. Playing a minor role of Captain Gene Mauch, Keaton nailed the part of the quirky, crazy guy and Eva Mendes wasn't just easy on the eyes in her scenes as Gamble's 'plain' wife Sheila. She was great. Yes, I haven't said a word about the story. Doesn't matter. Just watch the film.